Stormwise will take many years to put into practice and will require a great deal of effort spent on educating and obtaining the cooperation of community officials and land owners. To get the most benefit in the short-term, Stormwise will focus on areas where the forest presents the greatest risk to power lines. Since Connecticut has nearly 17,000 miles of power lines, it doesn’t seem practical to evaluate the forest along the power lines from the ground, but fortunately, through remote sensing, we can learn much about the forest and the risk it poses to utility infrastructure from airborne sensors. Airborne light detection and ranging technology (LiDAR) allows us to measure tree heights and stand density as well as the slope and orientation of the terrain. Using Geographic Information Systems (GIS), a computer system that allows us to manage and analyze geographical data, we can use the LiDAR data to identify trees that are close enough and tall enough to be a potential risk to power lines. These data can then be incorporated into the University of Connecticut’s storm damage prediction model thereby making it more robust in its predictive ability. During last summer’s Emerald Ash Borer Survey I drove along River Road in Killingworth somewhat amused by signage. A tree crew contracted to the power company had recently performed some right-of-way maintenance that included tree trimming and removals. The amusing signage indicated possession (or not) of the wood material left behind. “Don’t touch this wood!”, “Spoken for” and “Please!!! Take this Wood!!! Free! !” and variations thereof were all in evidence. Such scenes are not uncommon where power right-of-ways have been maintained. What is interesting is that all these signs also subtly indicate value, to someone, who might want to burn it or sell it or use it as a chopping block. Even the homeowner who wants to give the wood away reminds us that it is Free! Acknowledging that it has value and they do us a favor by letting us haul it away. At the top of a 40 ft. ladder, harnessed safely to a gently swaying hickory tree, UConn graduate student Jenna Klinck secures a tilt sensor that will record the movements of this tree for years to come. She is a researcher on a project in Dr. Mark Rudnicki’s tree biomechanics lab, part of the initiative called Stormwise. This part of the Stormwise team is measuring changes in tree sway dynamics with intent to evaluate and improve the resiliency of the forest edge in storm-force winds. Recent destructive storm events in the northeast have inspired utility companies, researchers and other collaborators to work together on this project, in an attempt to better prepare our communities. In the past, tree sway studies have been focused primarily on conifers where the timber industry can suffer severe economic losses from storm damage, and little attention has been paid to deciduous hardwood species. A critical look at how to best manage northern hardwood forests is long overdue, and UConn and its partners are taking the initiative. Along Chaffeeville Rd. in Mansfield is a site approximately 1.5 acres in size (a 600 ft. by 100 ft. strip) that is part of the "Stormwise" research and outreach initiative related to trees, forest conditions and storm resistance. The work is being supported in part by Eversource Energy. The site is one of eleven sites around the state that are part of this long-term study. Our long-term goal is to determine appropriate management approaches for roadside forests that eventually result in roadside forest conditions with species mix, density and structure that will be more wind resistant. It is an alternative, hopefully more comprehensive solution to the risk of tree failure during severe storms than the trimming-only program now being conducted by the utilities or the roadside clearing being applied by DOT. 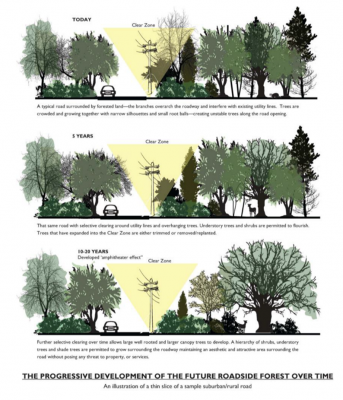 The basic concepts applied are 1) that trees with adequate space to grow, like any plant, will be healthier trees, 2) trees allowed to move in the wind will develop wind-firmness, 3) tree branches and crowns grow towards the light and thus lean toward the road, and 4) the right tree growing in the right place will not become a problem in the future. 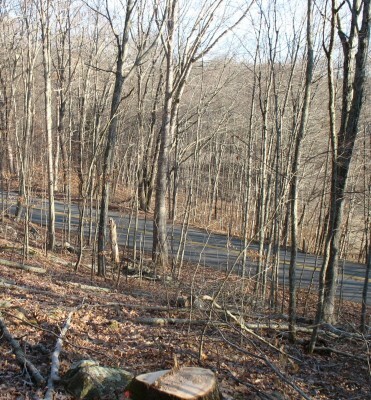 Most roadside woods in our region have never received any management besides trimming, and for the most part have grown somewhat like an unweeded garden. They typically are overcrowded, stocked with some healthy and some unhealthy specimens, and at 80 to 100 years of age, have a number of individuals that are at or near the end of their natural life span. While Chaffeeville Road might not have experienced many tree-failure problems over the years, some communities experienced severe tree related problems along similar wooded roadsides during recent storm events. The Stormwise initiative aims to address this broader issue. The specific management goal at Chaffeeville Road is to retain a canopy of taller trees that are healthy, straight, well-spaced and that have some longevity (about half the number), to bring along a sub-canopy of trees that will develop a shorter, broader, "bushier" appearance and create conditions that will favor the establishment of some younger trees to work with in the future. The Chaffeeville Road site was selected as one of our treatment sites for several reasons. As part of UConn Forest we have the ability to closely monitor the effects of the treatment over time, the forest stands along the road are quite typical of many other similar roadside forests around the state, the site does include an area of recent-past severe wind disturbance, and the site also affords the multiple educational opportunities from the training of our forest crew to educational workshops for members of the public. Thank you for your interest. Please don't hesitate to leave a comment or ask another question. We're here to help.